Chobe National Park is known for its vast population of Elephant, it is estimated over a 100 000 roam this area following ancient migratory paths. These tuskers and also huge herds of Buffalo, move from the south of the Park to north and gather along the Chobe River in the dry season. May and October is the dry season. It offers the game viewing opportunities on the banks of Chobe River because October is the hottest month and water is either scarce or non-existent, elsewhere. Likewise birding is excellent for the same reason, with migrant species arriving in the November to March rain season. The rains give rise to a a profusion of flowers and mast species are giving birth to young at this time.Covering around 11 000 square kilometres, Chobe National Park is the second largest in Botswana. Visitors will find 4 very different eco-systems. 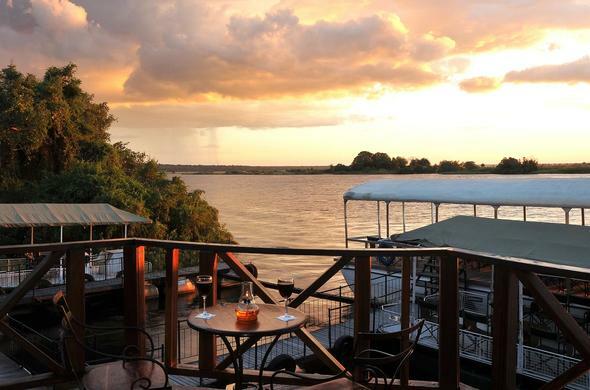 In the north-east there are dense forests along the Chobe River and the lush plains of Serondela. In the far north-west it is swamp territory on the Linyanti River, in the west there is the Savuti Channel and Marsh and in between a dry hinterland. Apart from Elephant, Lion, Buffalo and Zebra will see a lot of Lechwe, a medium size reddish hued antelope that particularly favors riverine areas. Also Bushbuck, Puku antelope and Hippo which congregate in the river. Cheetah can also been seen fairly often, with Hyena and Leopard being mostly nocturnal creatures. Birding enthusiasts can keep a look out for Pel's Fishing Owl and the African Fish Eagle. Of course, safari game drives in the early morning and late afternoon, accompanied by an expert guide and a tracker in the Chobe National Park. But even better is a boat safari on the river. Particularly when many animals come down to the water to drink. Which is very early morning and at sunset. Early morning, just before sunrise can give up evidence of nocturnal kills. Sunsets are spectacular, and just drifting peacefully on the river with a glass of champagne and the smell of the days settling dust accompanied by the grunts of hippo, the occasional trumpeting of elephants and the lowing of jostling buffalo Off-road driving and night drives are not permitted. Outside the Park, visitors can go on bush walks and night excursions. This is a popular Chobe wildlife area - with a number of waterholes and grassy plains, it is reminiscent of the Serengeti. These grasslands receive summer rains and attract huge numbers of Zebra in November who migrate from the Linyanti area. Visitors can also see Giraffe, Wildebeest, Roan, Sable and other antelope species, also Cheetah, Spotted Hyena and Wild Dog amongst many other predators. The Savuti region is also very arid in some areas, with withering heat and hot sand. The Gubatsa Hills form ancient outcrops rising 90 metres out of a flat landscape. There are some sites of ancient San rock art in the area that can be visited.